"So great hanging out with the legend Usain Bolt," Trevor Noah says of their meeting Down Under. Trevor Noah gets to meet famous people regularly as host of 'The Daily Show', but even he gets starstruck from time to time. 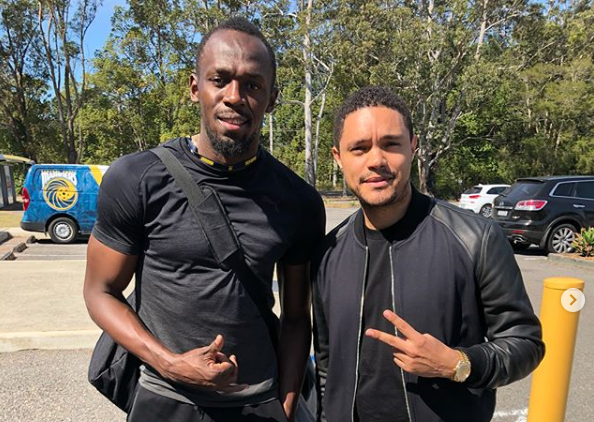 The 34-year-old met retired Jamaican sprinter Usain Bolt in Australia recently and couldn't help snapping a picture with the Olympic gold medalist. Trevor is in Australia for his stand-up tour, 'End of Days', while Usain is in the country to kick-start his career as a professional football player. The athlete will make his debut for local A-league team, Central Coast Mariners, on Friday. Trevor was all smiles when he met up with Usain in New South Wales. He praised the 32-year-old for pursuing his dream of playing professional football. "So great hanging out with the legend @usainbolt. He's just joined the @ccmariners soccer club in Australia and I'm so proud of him. Usain always dreamed of playing for a professional soccer team and now he's doing it! 8 gold medals and the legend still has dreams," he captioned a picture on Instagram. Usain shared the same picture on his Instagram profile. "Good to catch up with @trevornoah today and talk all things football," he wrote.